I have been so excited to post this hairstyle ever since I filmed it. 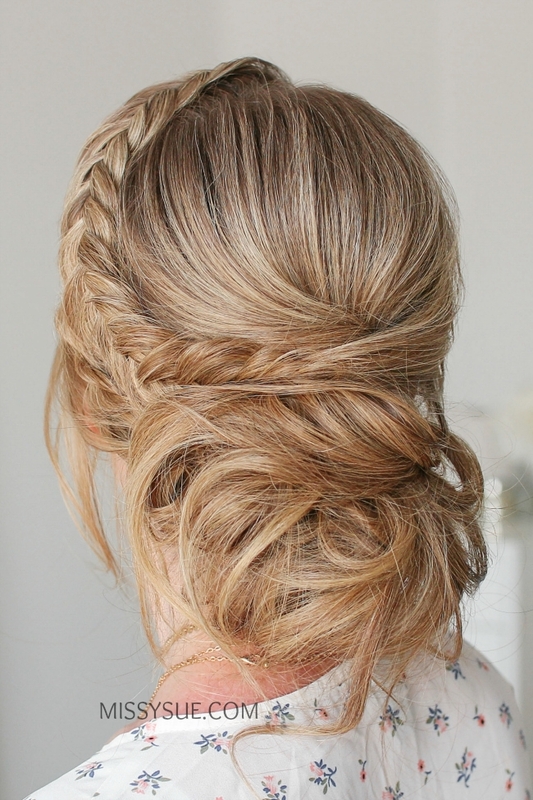 Updos are my very favorite and I love this combination of both braids and messy bun. This hairstyle is inspired by @alex_haircraft on instagram. I love following her account because she always posts unique hairstyles. Needless to say I am absolutely obsessed with this look so I hope you enjoy it just as much! Step 2 / Divide out a section of hair on the heavy side of the part, from the part line down to the left ear and clip away the forward hair. Step 3 / Now divide out a small section on the right side from the part line down to the right ear and clip away the forward hair. Step 4 / Now divide out a section of hair at the crown and clip this away. Step 5 / Combine the bottom section of hair together and wrap it with an elastic band. Only pull the hair halfway through on the last wrap to create a loop. Step 6 / Take sections of the loop, bring them up to the head, and pin them in place with bobby pins. Step 7 / Now take the ends left sticking out and tuck them into the hair band to form the bottom portion of the bun. Step 8 / Let down the hair at the crown and gently back comb the hair to create some volume. 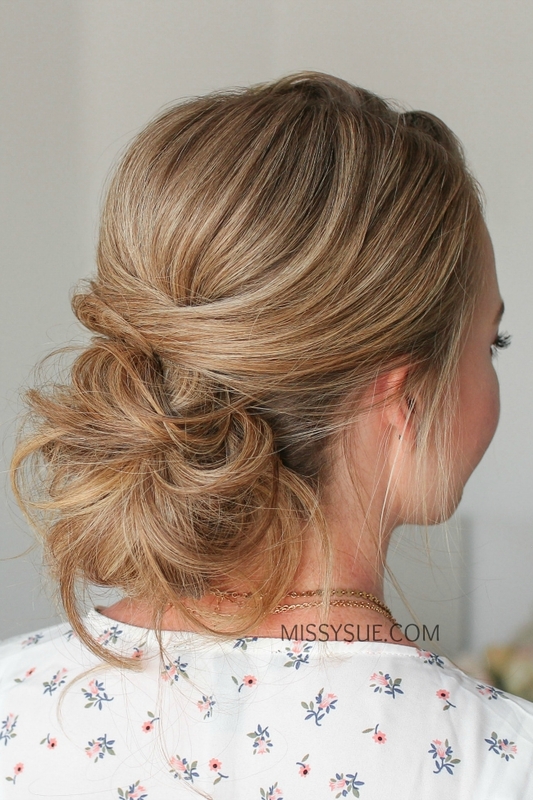 Step 9 / Then smooth the hair over the bun, twist it together above the bun and pin it in place with bobby pins. Step 10 / Let down the front section of hair and divide out a section for the dutch fishtail braid, clipping away the forwards section of hair. 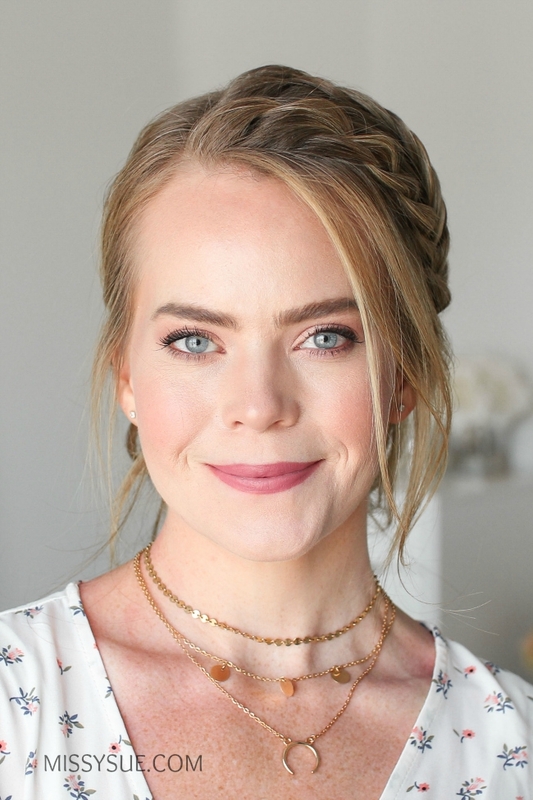 Step 11 / Braid the section into a dutch fishtail braid by dividing the hair into two sections, crossing small sections under to the opposite side while incorporating new pieces into the braid and working down to the temple. 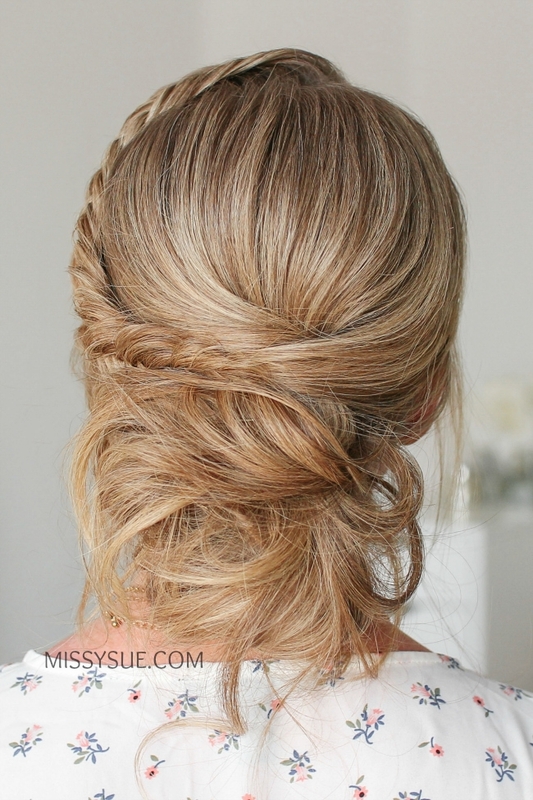 Then continue the braid to the bottom and slide a bobby pin over the ends. Step 12 / Then I’m going to take a small section from the left side, cross it under to the right strand, then pick up a new section of hair and cross it under to the right strand. Step 13 /Pick up the forward section of hair on the left side and create a rope braid by dividing the hair into two sections, cross the left strand over the right, add in new pieces to both sides and continue crossing the left strand over the right until all of the hair is brought in. 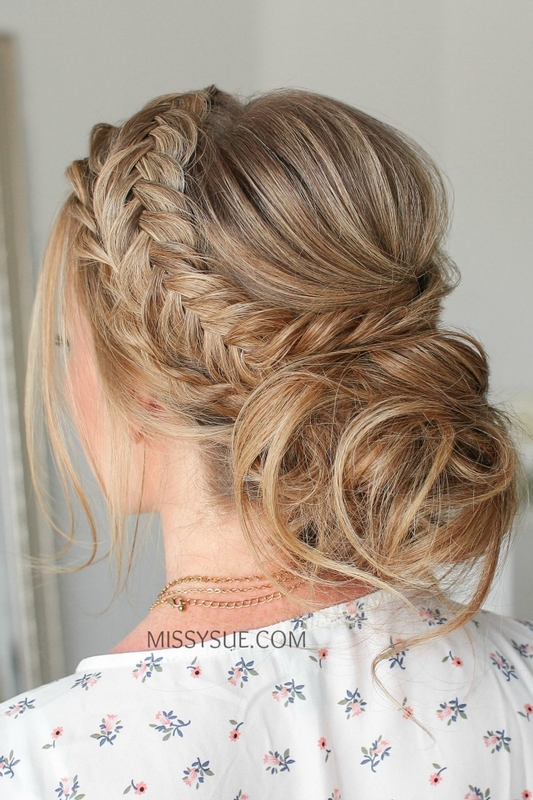 Then continue the braid down to the ends and slide a bobby pin over the bottom. 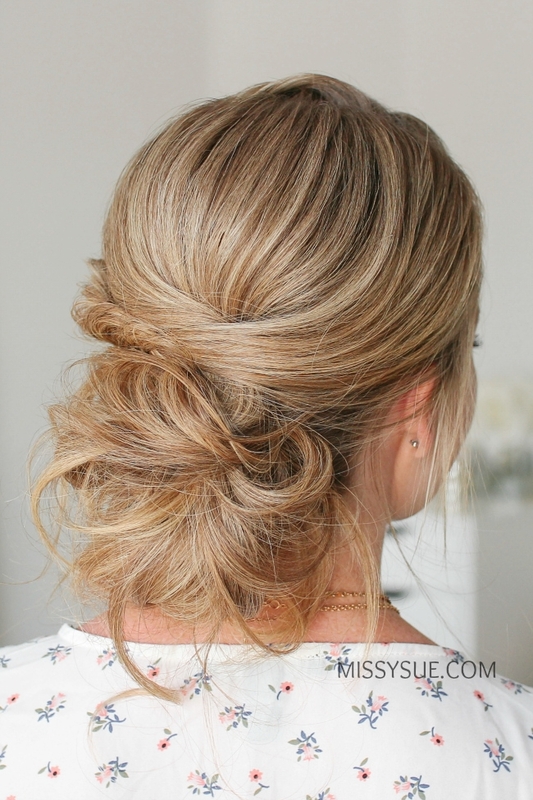 Step 14 / Let down the hair clipped away on the right side, drape it over the bun and pin it in place with a bobby pin. Step 15 / Go back over the fishtail braid and pull on the edges to make the braid fuller. Step 16 / Drape the braid over the bun and pin it in place. Step 17 / Then take the rope braid and pin it next to the bun. Step 18 / Pin any hair under the braids next to the bun. Step 19 / Now take the hair from the crown section, twist it over the top of the bun and pin it in place. Step 20 / Then take the ends left sticking out and pin them in random places around the bun to finish the style. Step 21 / Set everything in place with hairspray and smooth down any flyaway.